There has always been a pattern to generations. Historically youngsters accept their parents idea of what they are supposed to do, but around puberty there is normally a little rebellion. When youngsters transition from school to work there are adjustments that can be difficult for all parties. But now it is safe to say the world has changed at such a rapid pace that generations can be differentiated each with a different approach to work. The old patterns have been complicated by revolution in one sense. This second edition was needed to refine our understanding and reduce conflict. What has changed much more than human nature is the times. History is going at a faster pace and the way we grow up and integrate ourselves into the work world is constantly changing. Although we are all essentially human differences are significant enough that they can cause friction in the workplace. The authors discuss the differences and the causes in enough detail that the reader can look around themselves and see much truth and perhaps some exceptions. There are many dates thrown about, but the authors found the following the most practical at this time. Traditionalists born before 1943 experienced World War II and the Korean War. Boomers born 1943 to 1960 experienced an expanding economy, teenager power and the assassination of Kennedy. Generation X experienced economic turbulence and major technology advances. The Millennials grew up in modern technology and perhaps more than any previous generation had their lives programmed, but ran into still more economic downturns. As a Baby Boomer myself it is easy to observe the general characteristics of the three older groups that give some insight, but few surprises. I was at first surprised by descriptions of the Millennials. Naturally they are more comfortable with new technology than the rest of us. They lived through a much more protective age than us older people and consequently are more concerned over safety and risk. On the other hand they have been greeted with a rough job economy. Some of them with strong technology credentials are able to get jobs, often high paying, but if they didn't possess noticeable skills they were forced to study or accept lesser jobs when they were available. They had good relations with their parents and many rely on them for advice. Their priorities are different--they work to live, not live to work and would disappoint many of their elders in their work ethic. They are very much into collaborative efforts. Pretty well everyone has had a generational conflict. It boils down to the other person doesn't see things the way you do, but it doesn't have to be fighting all the time. 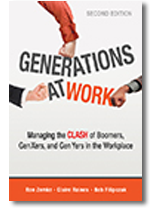 The authors believe that there is an opportunity to benefit from multi-generational businesses. Companies can be more creative with input from different perspectives. They can provide a comfortable response to a wider group of customers. Decisions made as a group are more broadly based and more acceptable to the workers and managers. Of course there are a few obstacles. Two principles to pave the way are to communicate effectively to everyone and to develop differences as a strength. Mentoring can be helpful, but one concern is that Boomers who lecture are resented by Generation X. Also mentoring should be two way from older to younger, but also younger to older. Some larger companies provide formal education to help one generation better understand another generation. Each generation needs to have its perspective respected and each can benefit from a general understanding.